I happen to love these Baked Brown Sugar Chicken Wings from Domestic Fits (I used bone in chicken thighs and let them cook until my meat thermometer said they were done, which was probably about 30 minutes). They are extremely tasty and I love that you toss them together and bake them. Nice for an easy, hands off meal. 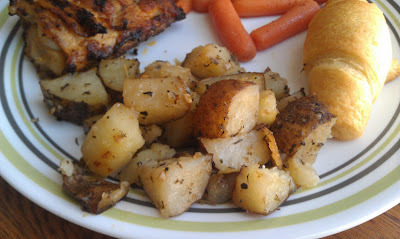 I threw together these yummy potatoes to cook along with the chicken and I loved the mix I hit on this time. I like my potatoes well seasoned and these fit the bill. And along side that chicken they were a nice and wonderful fully savory dish to complement the sweet chicken. Combine spices in a small bowl. Toss diced potatoes with olive oil and the garlic cloves and onions. Sprinkle spices over potatoes and toss to coat. Bake at 425 for an hour, stirring once or twice. My husband lived in Switzerland for 2 years and always talks about the food he misses from there which is really just the cheese. My husband is a cheese snob. If he had his druthers we would be eating those $25 per pound gourmet cheese every day. Thankfully he settles for something a bit more in our budget but I do love to surprise him with those pricier cheeses occasionally. One other thing we talk about a lot is the chocolate. Man, once you have had good chocolate the stuff we Americans eat on a regular basis seems really awful. So, when our good friend dropped off a thank you gift of 3 bags of Lindt Lindor Truffles I was in chocolate heaven. Did I mention he had already given us 2 bags of these chocolates a few weeks before as a thank you gift? Yeah, he's a good friend to have. My daughter told us that those little truffles were her favorite treats. She will have such fine taste. Well, the only problem was we were moving in just a week or so and the chocolates were not going to make it cross country, in a hot car, in August. 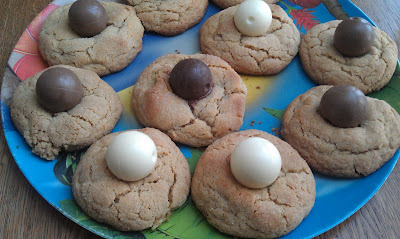 So I decided we would make these peanut butter blossom cookies but using the Lindor Truffles. You should have seen my hubby's face light up when I told him my idea. He really likes cookies. We had a lot of fun making these as a family. My little girl loved rolling the shaped cookies in the sugar and my son loved putting them on the tray. It was a fun family memory and our last time cooking as an entire family in that kitchen. Because these truffles are hollow in the center you need to wait a little longer to push them down into the cookie so they don't melt and let out that wonderful filling. These cookies are rich and divine and were such a lovely way to treat ourselves among all the chaos. Thanks Adam for the truffle supply! Cream butter and peanut butter together until fluffy. Gradually add the 1/2 cup sugar and brown sugar and beat until light and fluffy. Add egg, milk, and vanilla, beat until combined. Combine flour, baking soda, and salt. Gradually add flour mixture to peanut butter mixture, beating until well combined. Shape dough into 24 balls and roll in the 1/4 cup sugar. Place 2-inches apart on an un-greased cookie sheet. Bake at 375 for 8-10 minutes until cookies are golden around the edges. Remove cookies from baking sheet and place on wire racks to cool. After they have cooled a few minutes press the truffles into the cookies. Cool completely (or almost completely depending on your will power). I cannot tell you how these keep because they only made it to the next night. Please don't judge. Find them here on Amazon (This is an affiliate link). Wow, just had to share! 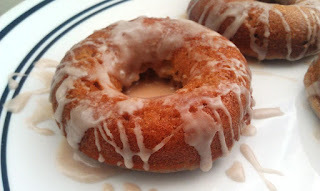 I'm doing a little happy dance today because I saw that my Baked Apple Pie Doughnuts were included in the 50 Apple Recipes Round Up at Happy Hour Projects. There are some amazing looking (and sounding) recipes included in the round up so I encourage you to go check them out! Happy Friday! Have I mentioned I love Mexican food. It's such a staple in our home that we probably have it at least 2-3 times a week if not more. This recipe from Miss Emily at One Lovely Life is simply wonderful. 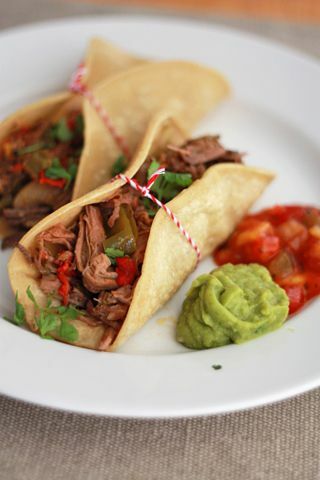 I'm in love with these carnitas and the fact that they are made in the crock pot. Emily and I go back to our good ol' college days when we were both newly married. Our husbands knew each other from high school and we happened to show up late to church when Mike was introducing himself and Emily. We had a little bit of an awkward moment when he saw my hubby and threw out that he knew Mitch as we were trying to sneak in unobserved. Mission failed. Oh well. It's a funny moment to remember. If you don't read Emily's blog I think you should. Not to be bossy but she is such a ray of sunshine and such a happy person and that totally comes across on her blog. She is perhaps one of the kindest people I know and a darn good cook. I still use all of the recipes she shared when she was teaching a cooking class to some of the girls from our church. She has always been my inspiration in blogging. I've watched her blog come a long way so it gives me hope for my little blog. And now that I have thoroughly embarrassed you, Emily, let's move on to the link to this absolutely divine crock pot recipe. Check it out, put it on your list to make, and I really hope you enjoy it as much as we have. It's simple and downright lick the plate good. And that makes it a keeper in my book. I have made no changes to this recipe. Let me repeat, it's that good. The end.